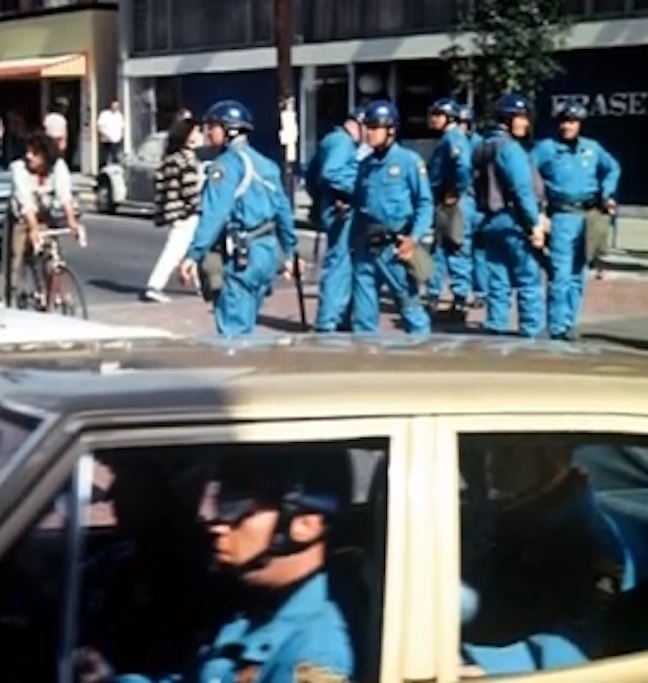 This was the aura when I first saw Telegraph Avenue in July 1968. What a time it was. 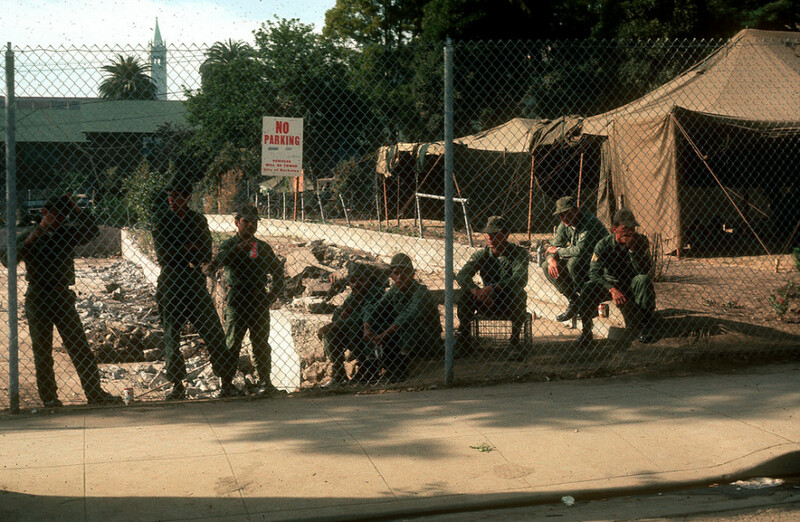 The USS Pueblo crisis, the Tet Offensive in Vietnam, Eugene McCarthy’s challenge and President Johnson deciding not to run for reelection, the SDS take-over of Columbia University in protest of the university’s ties to the Institute for Defense Analysis and objections to the proposed Morningside Park gym, the assassination of Dr. King in Memphis, the assassination of Robert Kennedy in Los Angeles, the uprising of students in Paris and general strike in France, Alexander Dubček and the Prague Spring – the world was spinning off its axis. And still ahead were the Democratic Convention in Chicago, the Soviet invasion and occupation of Prague, and the Mexico City Olympics. What a year! 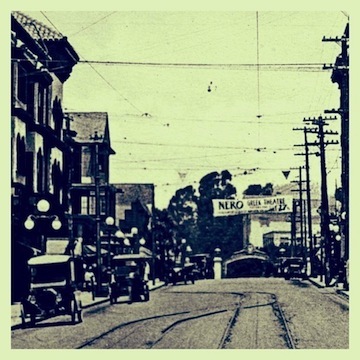 And Telegraph Avenue right in the middle of it. My mentor and lifelong friend Doug Adair brought me up to Berkeley for a weekend away from Delano, where I was starting my time with the United Farm Workers. 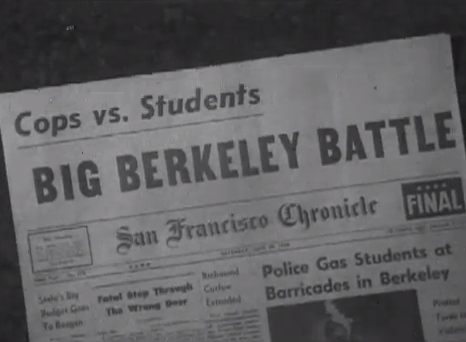 Boy was there a lot happening on Telegraph then. 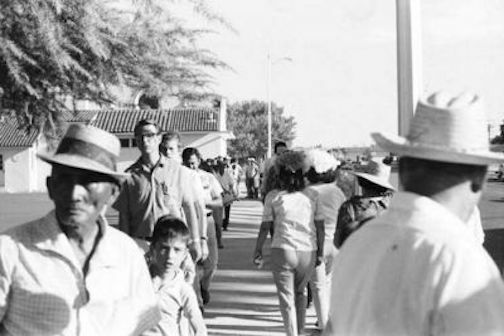 Delano’s abject rural poverty and the glory of the struggle of the United Farm Workers had been epiphanies for me. And then Telegraph Avenue. I admit – it was a shock to my just-barely-17-year-old Main Line Philadelphia prep school Episcopalian eyes. It was more than I could absorb. But that is not all of what I mean, or even a lot of what I mean when I say “old weird Telegraph. Time out! 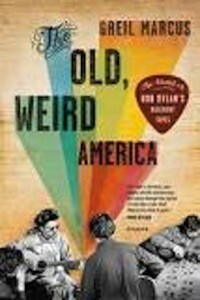 To be perfectly clear about to whom I am alluding when I say “old weird” – Berkeley cultural thinker and critic and writer and genius Greil Marcus wrote of old weird America. They are his adjectives, and they are perfect. I use them with great reverence for his coining and his writing. 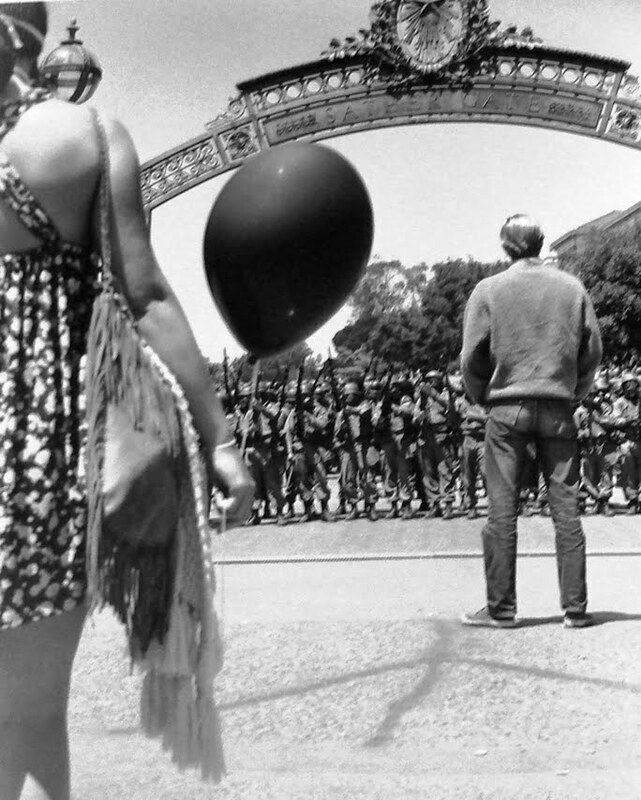 For 50 years Telegraph Avenue has been the Boulevard of Unconventional Berkeley – a Bohemian enclave, then the Free Speech Movement, anti-Vietnam War, People’s Park, hippies, punks, street people. 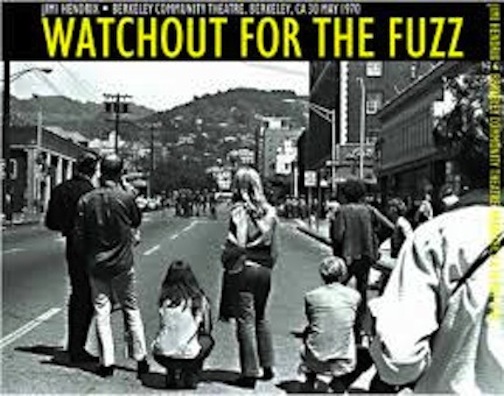 It is not possible to talk about Quirky Berkeley without some mention of Telegraph Avenue and the blocks of Durant, Hastings, Channing, and Dwight just east and just west of Telegraph. 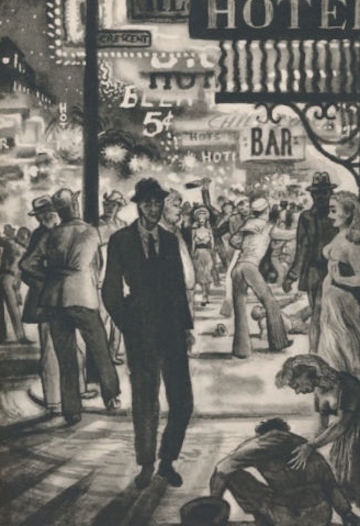 And it is not possible to talk about Telegraph Avenue without talking about the past. So here I talk about the past. The old weird past. For me, who wasn’t here then, the Telegraph Avenue past of greatest interest is Telegraph between the early 1960s and the early 1970s, and that will be the focus of future posts. 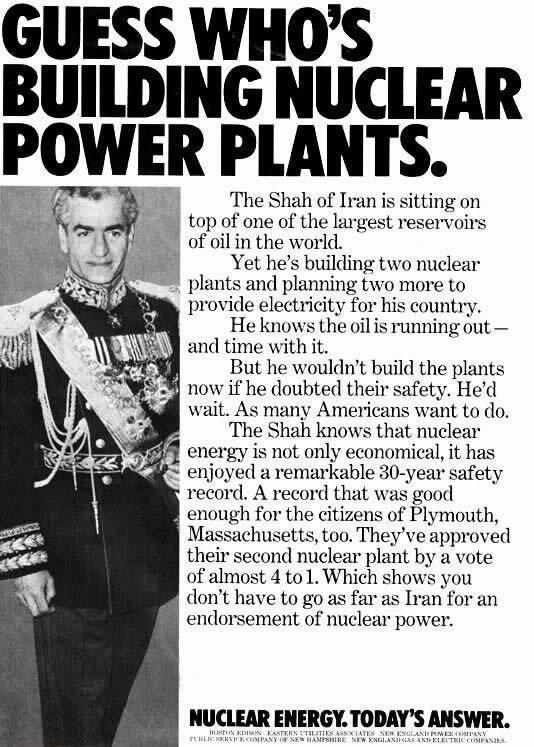 First, though, a little history. In the beginning, Telegraph was a street of mansions. 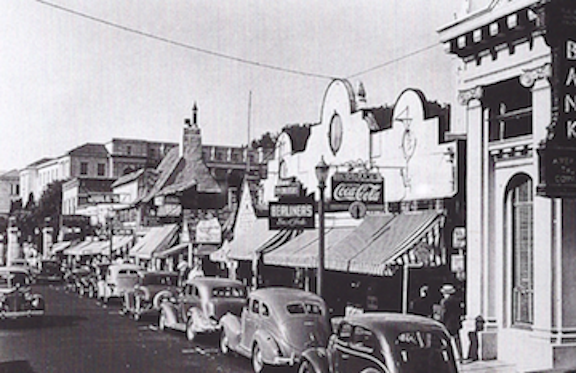 Daniella Thompson has written well on this era for the Berkeley Architectural Heritage Association, and you can read her here. 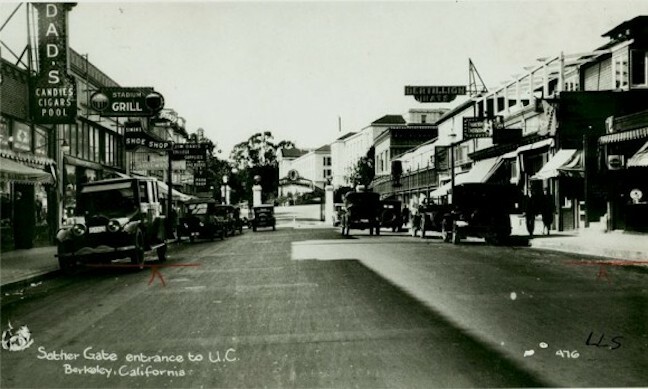 Then came the large apartment buildings, and Telegraph became like many university-adjacent streets, a combination of residential and catering-to-university-student businesses. 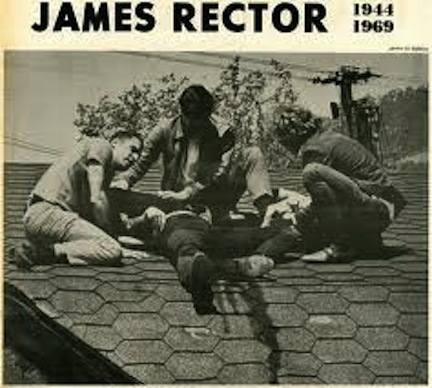 I have collected some photos of this era here. And then it started to change. 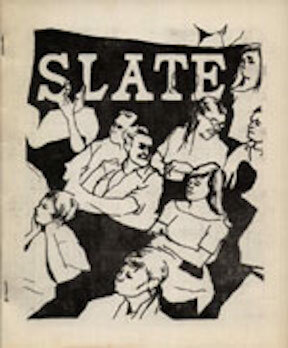 In the late 1950s, as the Beat movement crested in San Francisco with some spill-over in Berkeley and as New Left politics took their first steps with the campus group SLATE, Telegraph began to change. The manifestations of Bohemia seen then sound hopelessly square now – but then was then, not now. 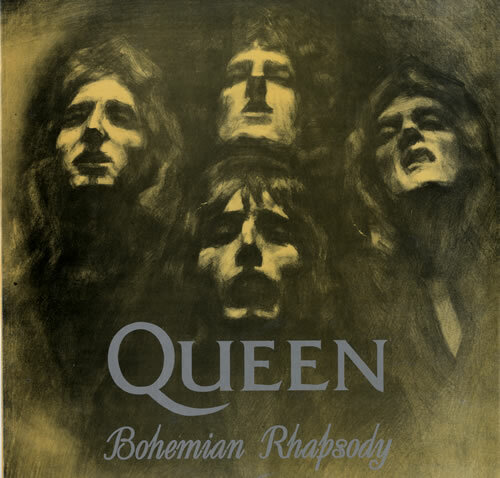 Not that Bohemia and not Queen’s rhapsody either. 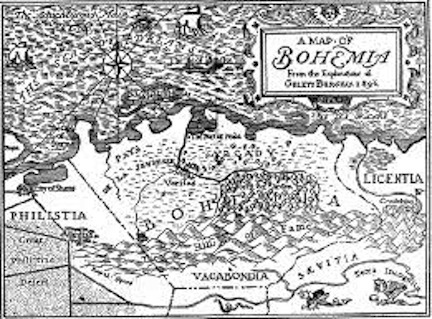 Bohemia as the notional place of Bohemians, as “one who either cuts himself off, or is by his habits cut off, from society for which he is otherwise fitted; especially an artist, literary man, or actor, who leads a free, vagabond, or irregular life, not being particular as to the society he frequents, and despising conventionalities generally.” Thanks, as always, to OED. 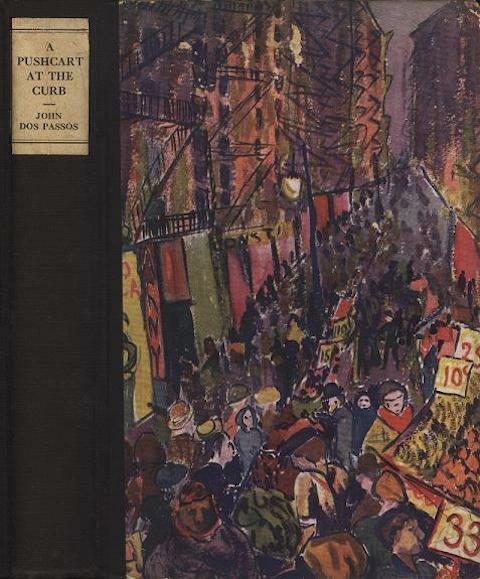 On Telegraph you could buy out-of-town and even foreign-language newspapers, croissants, espresso drinks, and Turkish cigarettes and Gualoise. You could watch foreign-language films, and play chess, and everywhere was Baroque music and took music. 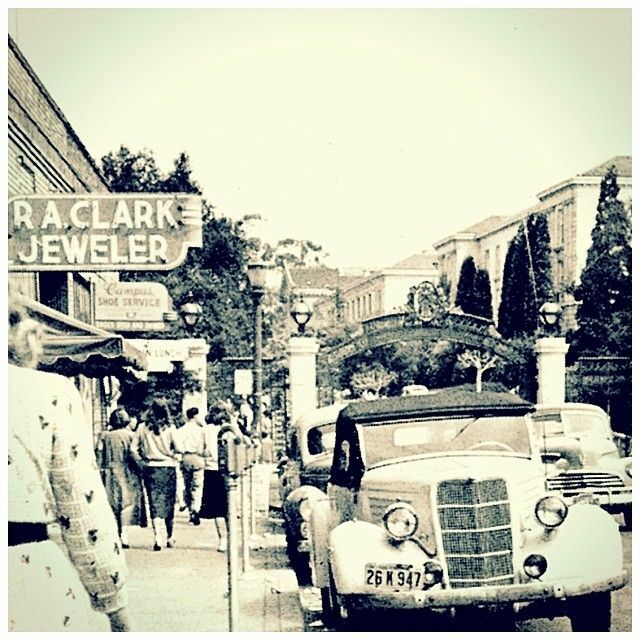 There were boutiques and haberdasheries and art galleries and mom and pop grocery stores. And the used bookstores! What a world! 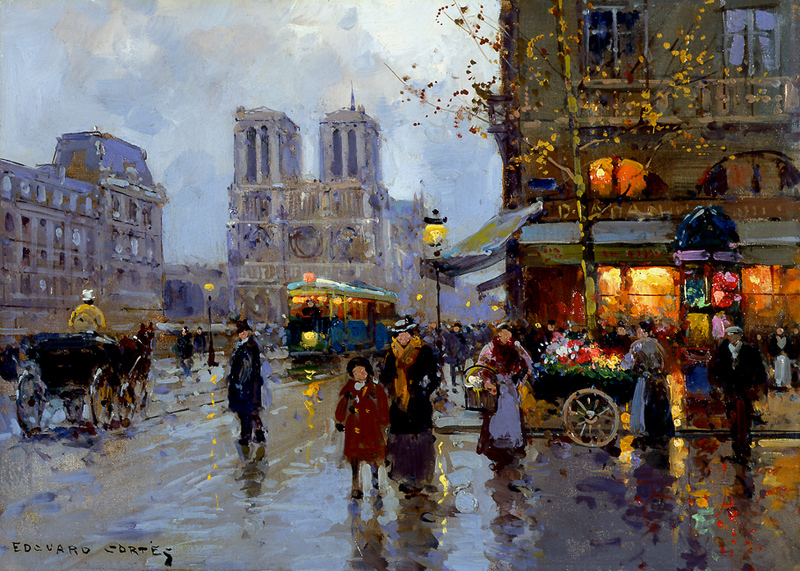 We were Athens, this was our Bleecker Street – Telegraph was our Boulevard Saint Michel. 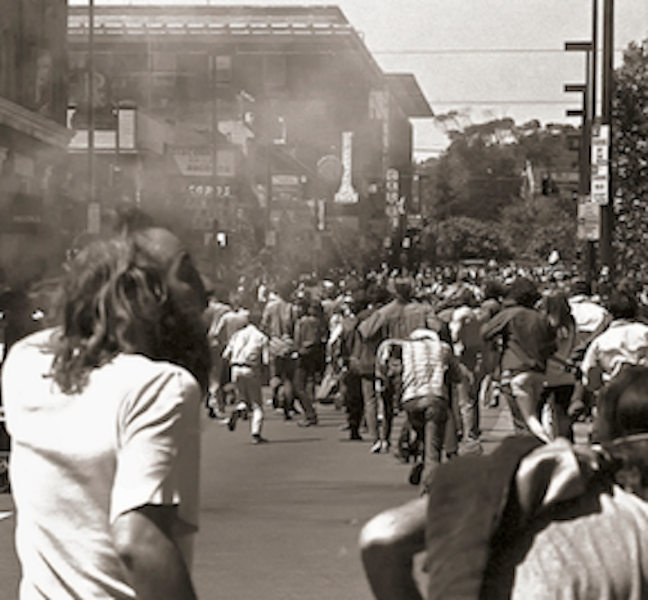 In the mid 1960s, things started to change again with the coming of the counterculture. In 1966, the Forum – an espresso joint in what had been Lucky Store #18 and is now Amoeba Records – briefly barred longhairs. 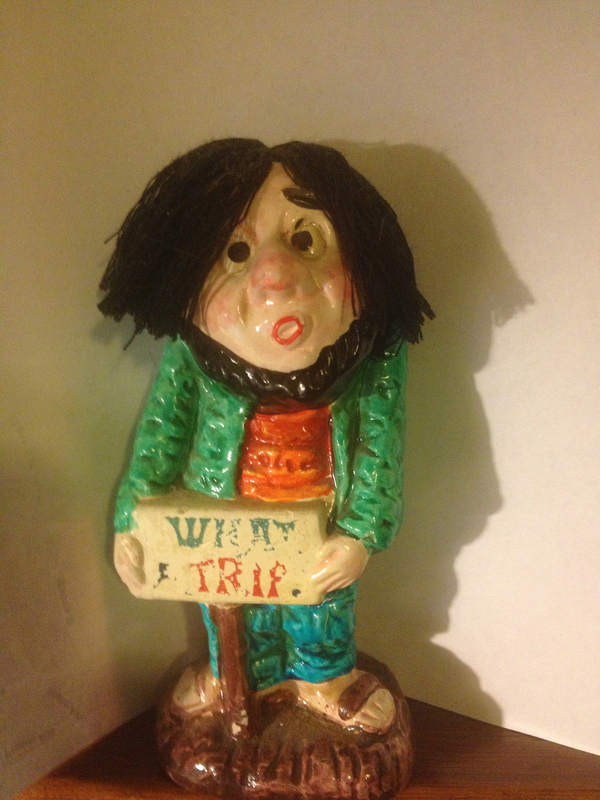 No espresso for hippies! 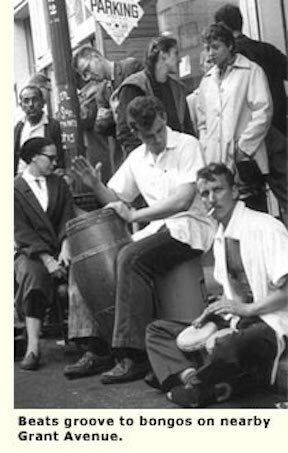 Bohemians reject hippies! But the changing tide was unstoppable. And then Telegraphy got gloriously weird. No holding back – giant steps from the shadows, no excess left behind, not for the faint of heart. Full speed ahead! No holds barred! Andale pues! 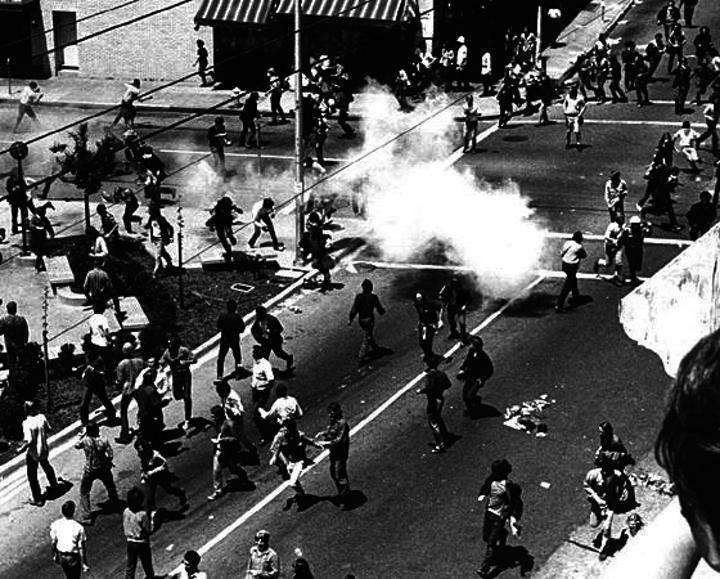 Finally it was time for the images that we hold in our mind as Telegraph – Berkeley police, Alameda County sheriffs, the National Guard, barbed wire and tear gas and live rounds – revolution! 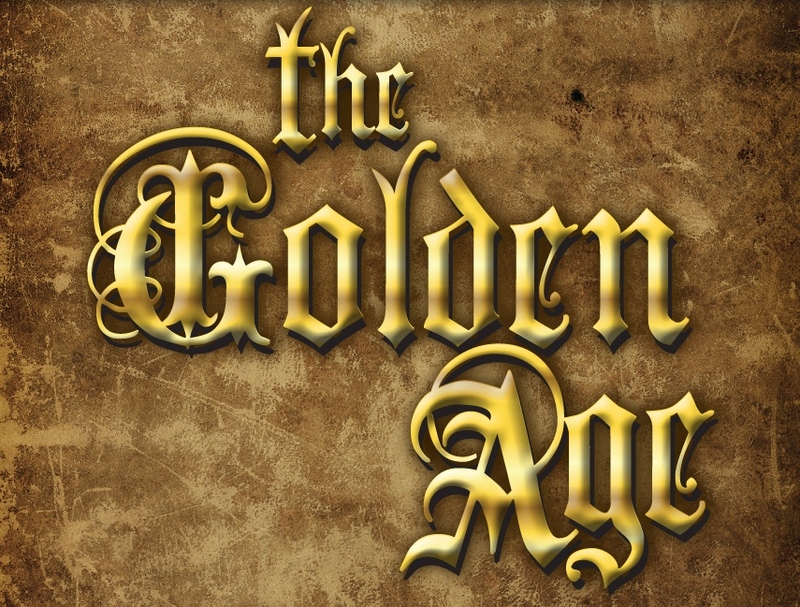 By the mid 1970s what I am calling Old Weird Telegraph was gone, which is not to say that there wasn’t glory after the mid-1970s or that there is not glory now. 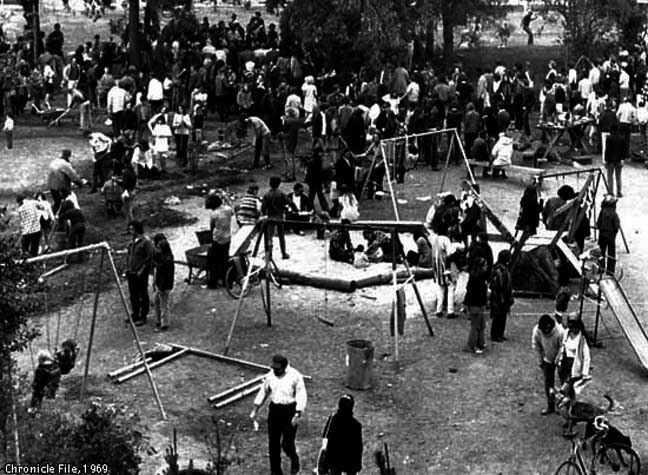 But it was here once, with its Bohemian and Counterculture Glory, from Free Speech to People’s Park to the Red Rockets and Mini-Mob, and is here remembered. Before future posts on the Bohemian/Counterculture/Golden-Age Telegraph, let us pause and remember a block of Telegraph that is no longer with us. It was gone by the early 1960s, but within it lay many of the seeds of Bohemian Telegraph, old weird Telegraph, quirky Telegraph. 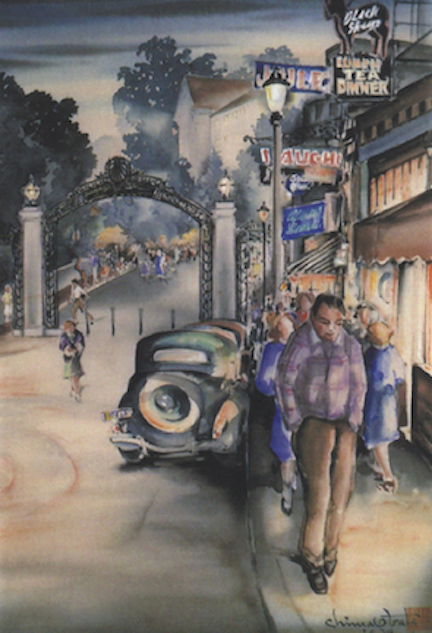 I know that “iconic” is a word that is easily overused, but for me, the 1939 Chiura Obata watercolor of Sather Gate is the iconic image of Telegraph. It shows a time and spirit that are gone. 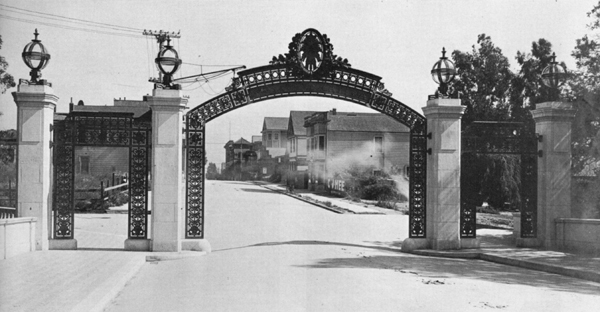 Once upon a time long ago, Sather Gate marked the southern edge of campus. Telegraph extended north past Bancroft to Allston. 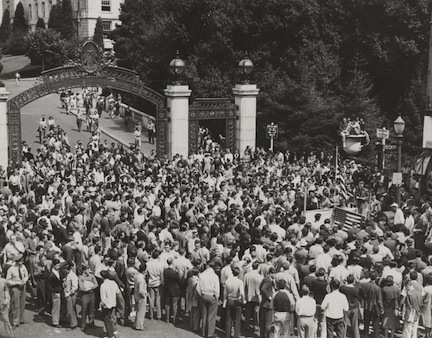 There are many more images of Sather Gate from the early days. Here is a protest against the draft in 1940. Yes – 1940! 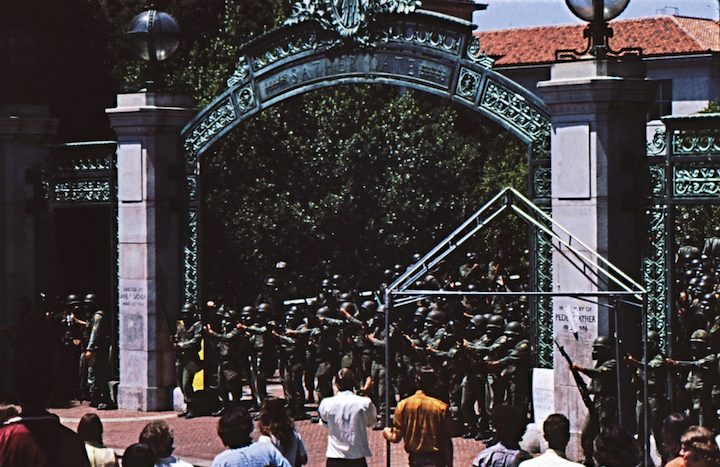 These will do for my purposes, although I have more old photos of Sather Gate here. In the late 1950s, the University demolished the stores and businesses that lined Telegraph between Bancroft and Allston and built the student union, which opened in 1961. The old Telegraph that has the strongest pull for me is that long-gone block between Bancroft and Allston. I never saw it, and so it exists for me only in black and white photos. Photos of the Black Sheep from Yelland’s personal scrapbook, now safe with the Berkeley Architectural Heritage Association, showing a stunning medieval revival building. It is high-degree quirky. You see a Bancroft address on the matchbook. That is because the Black Sheep was severely damaged by a gas explosion in 1936. Julia Morgan designed a new spot for the restaurant in a courtyard on the 2500 block of Bancroft in 1939. The restaurant is long-closed, and renovations have obscured all of Morgan’s creativity. I went to my friend’s room to show him these photos. He asked me to look at something first. He has a point, although nothing is quite that simple. I steered him back to the photos. 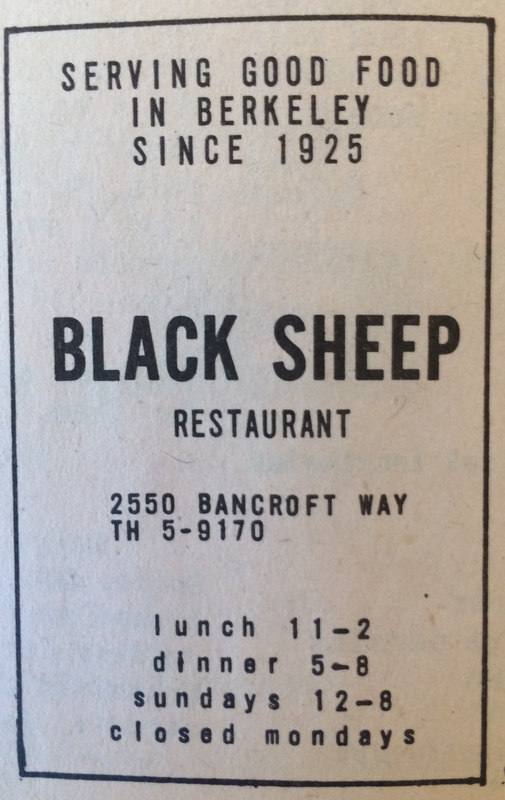 “I knew a couple who ate at the Black Sheep all the time. They’re pretty old. They really dug it.” How about the photos, the rest of it? 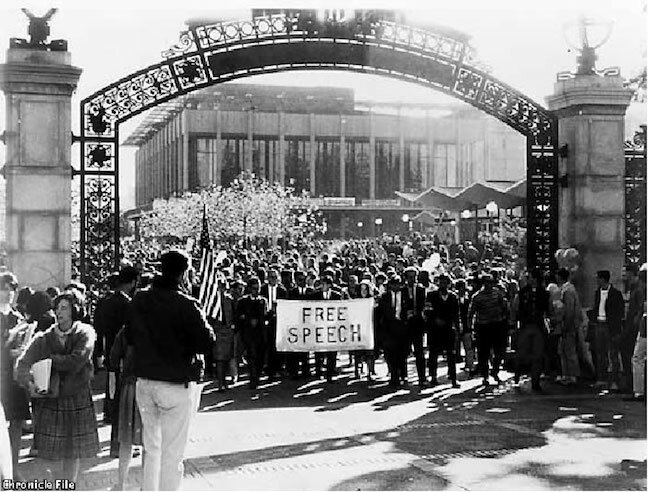 During the same time that UC secured the lost block they also stole the First Unitarian Church of Berkeley through a claim of Eminent Domain. 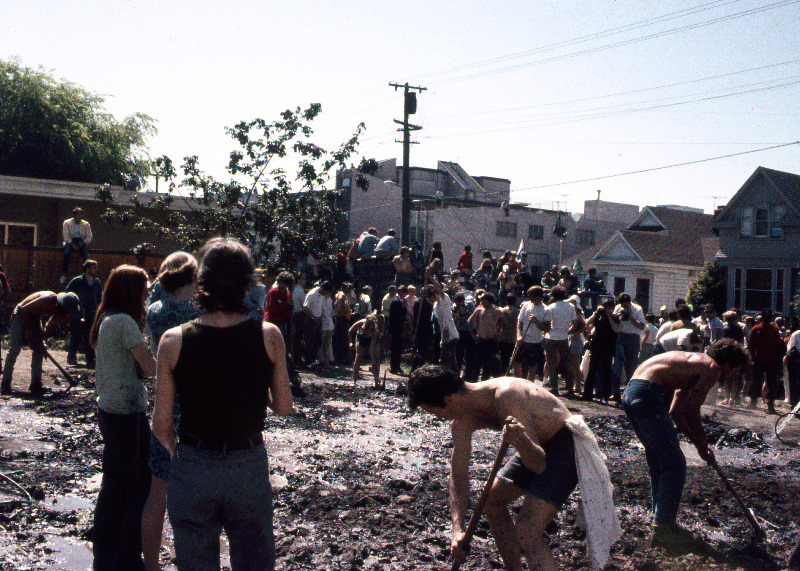 Fortunately the original building, designed by the architectural firm where famed architect and unitarian church member Bernard Maybeck worked, still survives at 2401 Bancroft although the entire congregation was evicted. The church successfully sued the UC and with the money from the court settlement was able to purchase land in Kensington at cost from Maybeck and build a new and larger church. the Unitarian Universalist Church of Berkeley located in Kensington, and the Berkeley Unitarian Fellowship located at Cedar and Bonita. I was doing research on my great-grandfather’s store, “Garwood’s Bootery/Shoe Shop” and came across your site. Would like to know if you know when it closed, or know anything else about it. Thanks. 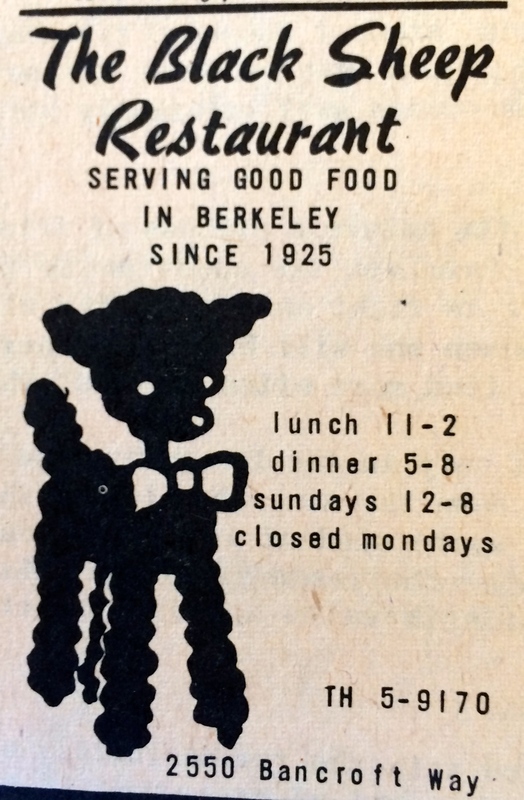 My grandmother attended the Univ of Berkley and worked at the Black Sheep tea room in the late 1920’s and early-mid 1930’s. She is gone now, but it was wonderful to see where she worked and went to school. 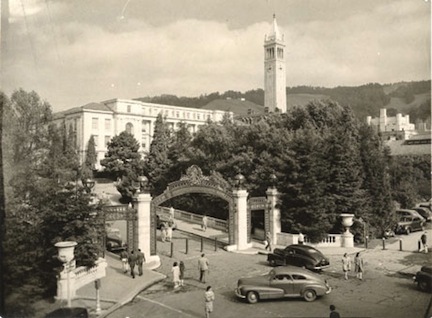 My Berkeley family lived at 2221 prince St, just below Telegraph, My mom graduated form Berkeley High and the UC. She was 16 when she enrolled at UC, the year was 1922. She married my dad in 1928 and moved to Ophir, Placer County. 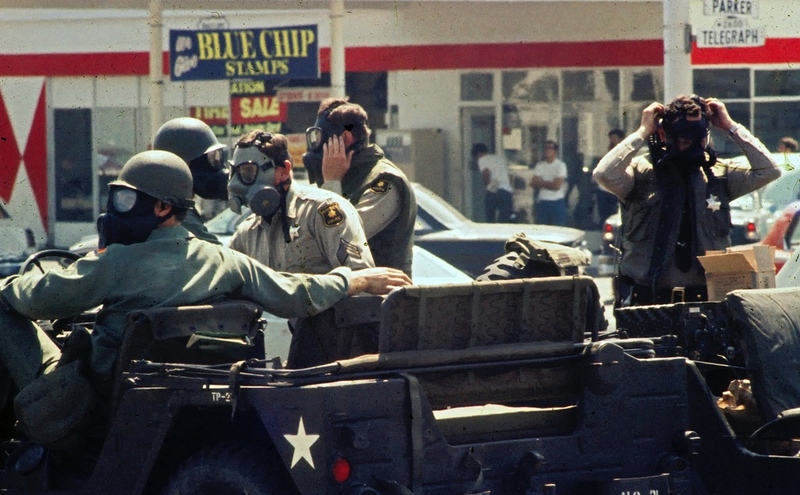 My brother and I spent many good times visiting Berkeley relatives who had lived through the big “fire” at the same address. 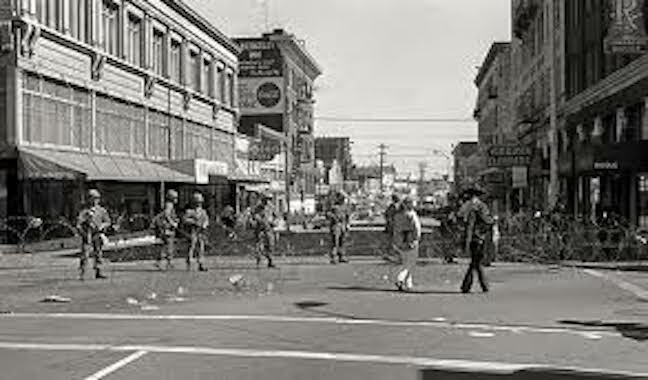 Watching Berkeley change was very sad for me. 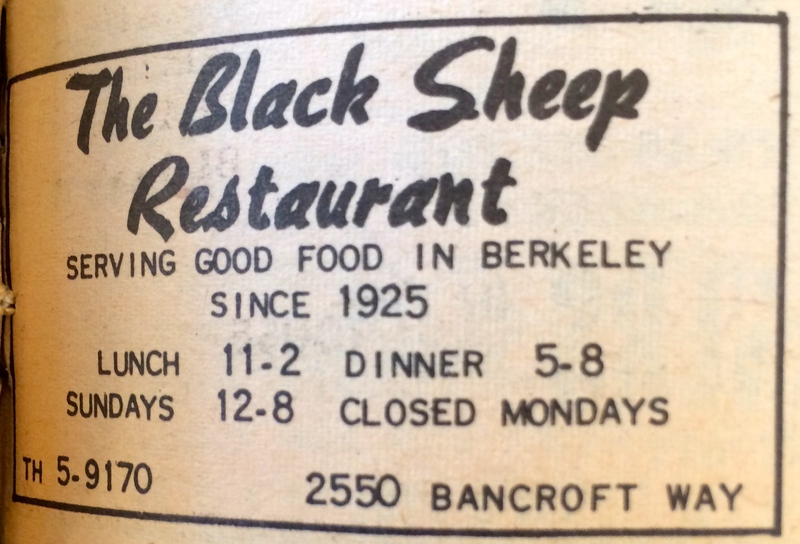 The restaurants I remember from the late 40’s were the Black Sheep, Litchee Huans [spelling] and the Sign of the Piper down on Shattuck. There was a tunnel you walked thru to get to the Black sheep, which had a lovely echo. I’d get restless at the table and would be excused to go out there and experiment with the echo. Great memories. 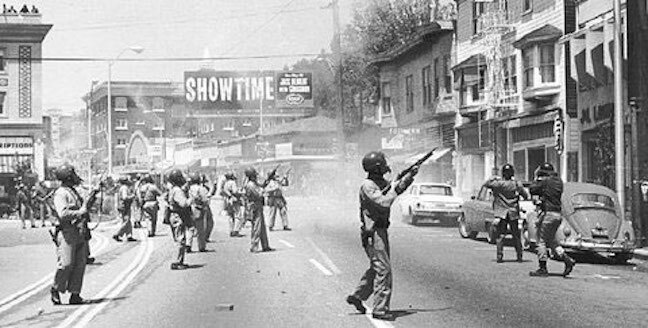 Sherman Clay and Roos Bros. were right nearby.